The first conversation any client wants to have is cost. Renovating or adding on to your house is no small investment. And we’ve met plenty of homeowners who abandoned their home improvement plans once they got a clear understanding of cost. Avoid this by setting your renovation budget at the start. So cursory and broad you can’t trust that they apply to your project. Were these people buying $6,000 toilets? Did they have their backsplash tile hand-fired in Milan? Or did they have Uncle Larry provide all the labor for free? So detailed and technical that they’re over most homeowners’ heads. I thought it was time for a straightforward, practical article about how to set a renovation budget for your project. My experience with construction costs and budgets is based almost entirely on planning projects that will be built by a general contractor. So if you’re providing all of the manual labor yourself or serving as your own GC, you may find this article less helpful. You can certainly save money if you do it yourself, but that strategy is usually only popular with clients who have more time than money (or both in equal measure). Another thing to consider is that homeowners who call architects often have tricky spaces. They’re calling us because the space doesn’t work. Making plan changes to remedy this problem does add cost. So most of our clients are typically spending more than if you’re renovating a space that already functions well. First, let me give you a wakeup call. I said home improvement is expensive. It is. Really. We’ve worked on 73 home improvement projects since we started our business almost 5 years ago. There was a steep learning curve for us about construction costs. Now I often provide clients with what we cautiously call an “opinion of probable cost” which is based on past projects of similar scope. I’ve gotten pretty good at predicting and often come within 5-15% of the bids. But do you know how many times a project has come in cheaper than what I guessed it would? Zero. Never has that ever happened. It always costs more than you think it will. Always. Now that I’ve burst your bubble, let’s proceed. I’m Not Saying You Shouldn’t Renovate…. I’m not trying to discourage you. I want you to renovate — so I can keep drawing awesome houses! But you should understand from the beginning that if budget is important to you, be prepared to defend it with your life. Ask for cheaper options (use the word “cost effective,” it sounds so savvy), think outside the box. Don’t get attached to fancy features and new gadgets you don’t really need. Before I give you a framework for setting your specific renovation budget, I’ll go over some common project costs we’ve seen in Knoxville. Knoxville construction costs are close to the national average; maybe a bit lower. It’s tough to get reputable research to quantify this, but I do like Hanley Wood’s annual Cost Vs. Value report for regional cost data. The least any of our clients have spent on a full kitchen renovation is $25,000. That’s new cabinets, new appliances, minor relocation of a wall and window, and the homeowner did demolition and painting themselves. So we’re talking a major overhaul; but done with cost in mind. These were Ikea cabinets, too, which are about the least expensive on the market. Most clients who do a kitchen overhaul (new everything, move a couple of walls and/or windows) spend $50,000-$60,000. If you want top-of-the-line appliances or you’re building an addition for your new kitchen, you’re looking at $75,000 – $125,000. Or more. They sky’s the limit, really. If you’re keeping all of the plumbing in place and just redoing cosmetic finishes like tile, countertops, vanity cabinets, etc., then you can probably get away with spending $10,000-$20,000 on a master suite renovation. Often, our clients are creating a master suite where none existed before (since we work in mostly historic homes, people have to co-opt a spare bedroom and make a master suite from scratch). For this, you’re looking more in the $30,000 – $60,000 range. You could totally spend more if you want a ton of fancy features like handmade tile, toilets with heated seats, or steel and glass shower doors. Or if you have to do an addition, the cost goes up from there. Additions range widely in cost depending on what you put in them. The cheapest space to build is a screen porch or garage. Next might be a family room or sunroom (no plumbing or chimney). Once you start planning kitchen and bathroom additions, costs go way up. The screen porches we’ve designed typically cost $125-$140 per square foot. If you’re doing an addition for your kitchen or master suite, you’re talking $400 – $500 per square foot. No, I’m not kidding. Considering that many of the kitchens we design come in around $300 per square foot and that’s working within the current house footprint, it’s very pricey to add on for a space like this. Now that I’ve shocked you with big-ticket projects, here are some numbers for the humble yet oh-so-necessary hall bath. For an existing hall bath where you’re gutting it and redoing everything (taking out the tub-shower combo in favor of a tile shower, new vanity, new toilet, medicine cabinet, new tile, maybe some shelves), we typically expect costs to be between $10,000-$15,000. If it’s a compact powder room (no shower or tub), you may be able to get by with $5,000 – $6,000. Less if it’s not a total gut job. Note: the biggest determinant in the price ranges I give above is size. There is no bulk discount when it comes to improving your home. The more square feet you renovate, the more you will pay. How much is it worth to you? This sounds obvious, but most people never ask themselves, “To get my ideal outcome, how much am I willing to pay? At what point is it no longer worth it?” I think because so many of us are optimists and we assume our ideal kitchen overhaul or brand new master suite can’t possibly cost that much, we never stop to think what we’ll do if it does. So have a number in your head — if the estimate comes back at $100,000… is that too much? Is $75,000 too much? Everyone has a deal-breaker number. What’s yours? Yes, you should consider ROI when setting your budget. Especially if you will rely on a loan or line of credit to finance your renovation. The banks will want to know whether you’re over-improving. But if you’re going to be in your house for the long haul and your outdated, non-functional space is driving you crazy, then don’t let yourself be tied too tight to ROI. You can justify spending a little more because you’ll get to enjoy the improvements every day for years to come. I hope this helps. Cost is such a contentious subject. We’re all such well-trained bargain-hunters we think surely there’s a way to get what we want for less. But I’ve seen too many projects get tabled once the estimates come in. 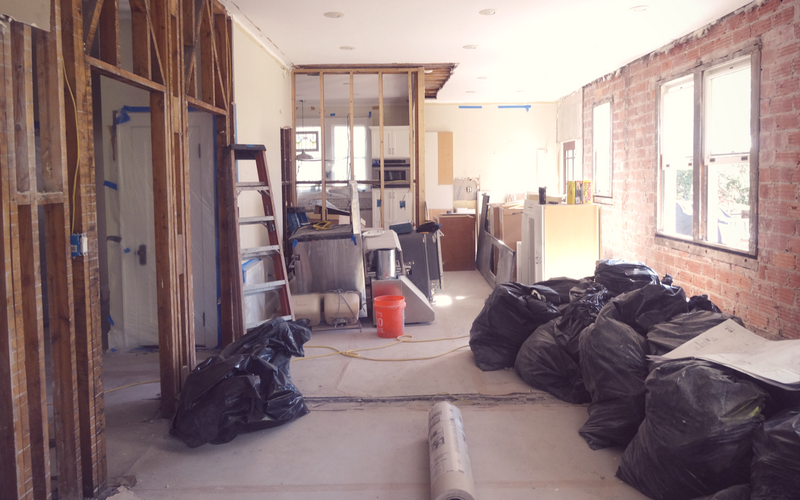 I wanted to provide some level-headed, reality-based advice to you fixer uppers out there about how to set a renovation budget. Really great information for me, as I’ve never had any experience with home improvement. Thanks, Elizabeth! Glad to know it was helpful. It never hurts to start a renovation with your eyes open!